Cake. 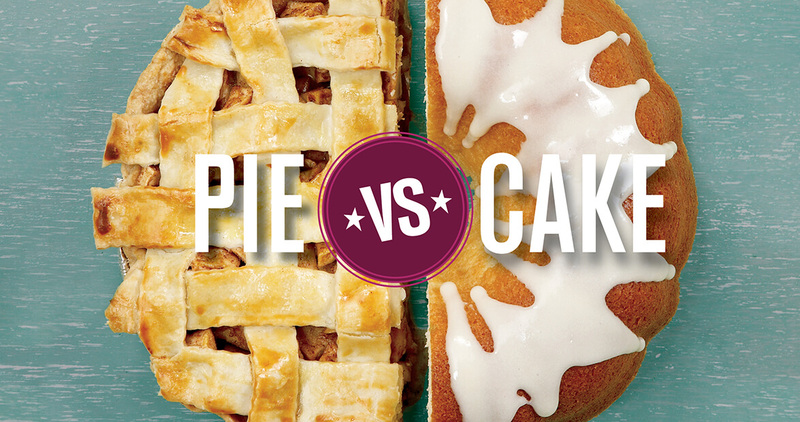 Or, maybe pie … No, definitely cake … Probably … Choosing between two worthy desserts may not be possible. Ladies and gentlemen of North Carolina, life’s difficult choices have left us a divided state. Our challenge is to find middle ground, yet we see matters in black and white — you are with me or against me, good guy or bad guy, red or blue. I have long placed myself in the purple area of the spectrum, yet we all know: Painful as it is, one has to choose. First, let’s discuss. Some things are obvious. Pie, it goes almost without saying, is a more mature dessert, a more complex, multilayered experience, in both the eating and the making. A pie can be dinner — shepherd’s pie! chicken potpie! — or dessert. It can be simple — apple pie — or surprising: rutabaga? In a pie? Seriously? And the crust alone takes an hour of patient rolling, folding, cooling, waiting, rolling again. A pie is patience. After you’ve spent hours on the crust, you still have to prepare and cook down the filling. Often you have to precook the crust. Like a city, a pie requires planning and even zoning: You organize your counters into crust area, filling area, rolling, assembly. And then you cook it, long and slow. When finished, a pie is a subtle melange of crust and filling, a mellifluous blend of ingredients, stewing together into an aromatic whole. Pie has complexity going for it. It has depth. There is, after all, no pie mix. So, then, cake. Cake rebuts all that adult complexity with a single word: sweet. Cake is never savory — and if cake is the main dish (don’t judge me! ), it means you are having either the best day or the worst day of your life. You don’t run into rutabaga cake, do you? Carrot cake, to be sure, but the name is actually a scam; the most significant carrot contribution to most carrot cakes is a big orange carrot on the top. So: sugar. Sweety sweet sweet. That’s cake. You mix up eggs and butter and flour and sugar and a few other things and you fling it into the oven and in a few short minutes it rises into this pillowy, fragrant, eye-roll-inducing cloud of warm sweet. And then, on top, instead of a crust that takes an hour to roll out, into which gentle vents are lovingly sliced, you put: frosting. Great big swoops and gobs of frosting. Frosting: that gilding of the lily, that shock-inducing fluff of butter and sugar that takes the cake experience from enjoyment to ecstasy. Yes, there is icing, to be sure, but in my opinion cakes that call for icing — basically a sugary glaze — misunderstand the function of both elements. Cake is fundamentally little more than a delivery device for frosting. And frosting? Frosting borders on the reason for existence. I’m asking you. Did anybody ever glance around, stick out a finger, and sneak a swipe of … pie when nobody was looking? No. That’s a cake thing — that’s a frosting thing. That’s a kid thing. Cakes are for kids, and for the kid inside you. You almost want to spell it Kake. Cake is the backyard swing set to the demure patio of pie. Mind you, I’ve cooked my share of complex cakes: I have made a Black Forest cake, with the whipping cream and the narrow layers and the shaved chocolate and the kirsch. It’s always an enormous hit at parties. But still: it’s cake. With sweet whipped cream covered by chocolate instead of traditional frosting, yes, but still, big corners of dessert, with that right angle of sugary perfection embracing the cakey matrix below. So I’m not saying you can’t complicate a cake if you want to. I’m just saying it’s big, sweet fun. With pie you close your eyes and make that tasting face, then some kind of comment. With cake you just kind of cram it into your mouth until you run out. But a warm pie for dinner can turn a chilly winter day into a Hallmark commercial for home, with steaming windows and meaty aromas greeting you when the door swings open. A cherry pie for dessert has a kind of melting comfort that so perfectly accompanies a cup of coffee you’d think they were invented by the same person on the same day. But who wants to do without cake? Without — and I admit this proudly — the best cake of all? A yellow cake you made from a mix, covered by the entire contents of a can of frosting? Yes, you heard me, a can of chocolate frosting. Yellow cake-mix cake and canned frosting! I declare this the king of cakes! The Platonic ideal of cakey goodness: warm, sweet, chocolatey, and eaten before you even know it. Nobody has ever — ever — had leftovers from yellow cake-mix cake with canned chocolate frosting. Locusts cringe in embarrassment, piranhas avert their gaze when presented with the carnage left by a table of people attacking a yellow cake with chocolate frosting. Oh, Sophie’s choice! Cake, curse you, I choose cake! I mean, if pressed I’d grit my teeth and do without pie, but it’s kind of like saying I’d rather lose my left leg than my right. I would prefer to have both. Though fundamentally a cake person, I believe our state needs pie just as much. Citizens of North Carolina, we can come together. We can choose the purple middle ground, and we can prosper in love and fellowship. Like every politician ever, I believe in — and promise you — the impossible. I believe we can have our cake and eat pie, too. Read the argument for why pie should reign supreme at www.ourstate.com/team-pie.